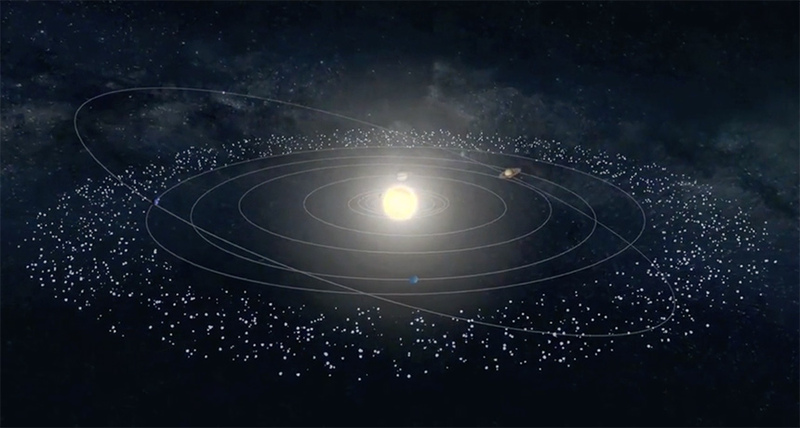 COME FROM AWAY Some interplanetary dust particles that end up in Earth’s atmosphere may have started life in the faraway Kuiper Belt (illustrated), a region of icy objects farther from the sun than Neptune. THE WOODLANDS, Texas — Grains of dust from the edge of the solar system could be finding their way to Earth. And NASA may already have a handful of the debris, researchers report. With an estimated 40,000 tons of space dust settling in Earth’s stratosphere every year, the U.S. space agency has been flying balloon and aircraft missions since the 1970s to collect samples. The particles, which can be just a few tens of micrometers wide, have long been thought to come mostly from comets and asteroids closer to the sun than Jupiter (SN Online: 3/19/19). One way to find a dust grain’s home is to probe the particle for microscopic tracks where heavy charged particles from solar flares punched through. The more tracks a grain has, the longer it has wandered in space — and the more likely it originated far from Earth, says Keller, who works at the Johnson Space Center in Houston. But to determine precisely how long a dust grain has spent traveling space, Keller first needed to know how many tracks a grain typically picks up per year. Measuring that rate required a sample with a known age and known track density — criteria met only by moon rocks brought back on the Apollo missions. But the last track-rate estimate was done in 1975 and with less precise instruments than are available today.